More and more we are seeing what I like to think of as incidental autism on TV and in movies. It surely isn't a surprise consider somewhere around 1% of American millenials are on the spectrum. Autism awareness has beeen a mantra over the last 30 years, but it is no coincidence that the social understanding and education came with an exponential uptick in diagnosis. Autism is now a part of our culture. Most people have a relative or close friend on the spectrum. Kids grow up with autistic children in their classrooms. There are even autistic characters on television (Sesame Street and Parenthood come to mind). But what we also see is this incidental autism. Characters that are not intended to be on the autistic spectrum but have many of those familiar traits that we're used to seeing in our everyday lives. Of course as a parent of someone on the spectrum, I have autism goggles. As I helped out at my child's school I would often notice other kids that were probably on the spectrum. Heck, in some cases teachers actually asked my opinion. Often I said, that nudging the parents towards getting a professional evaluation outside the school district would be a good idea. But I'm guessing that other folks less familiar can nowadays pick out these traits. Two characters that are very popular and many bring up the fact they seem autistic are Sheldon on Big Bang Theory and Sherlock Holmes (Cumberbatch version). I'm of the mind that they are not on the spectrum but do display many of the traits associated with it. Interestingly enough, there've been some studies that have shown brain function similarites as well has social/behavioral similarities between geniuses/prodigies and ASD. I'll toss a couple of links at the bottom if you're interested. Despite not being ASD, Sheldon has been a neat influence for Ethan. He likes the show a lot and is able to laugh at Sheldon's odd social behavior. It's good for him to be able to see it in action and relate to it. Also, Ethan picked up Sheldon's manner of directly asking, "That was sarcasm, right?" It's an area that Ethan has always struggled with, so having a way of comortably asking about it is awesome. This latest incarnation of Sherlock seems so much more on the spectrum than other versions, because I think it's mirroring what we consider odd social function in today's society, and much of what we see is autism. But again, I think we're seeing that overlap of genius and autism. The other day we saw Fantastic Beasts and Where to Find Them. Eddie Remayne's protrayal of New Scamander is probably the closest portrayal of someone on the spectrum that I've seen that didn't come right out and say this person has autism. Obviously, it's 1920's magical society, so yeah, not gonna say that he is, but my husband and I left the theatre thinking Newt was on the spectrum. He had the lack of eye contact, the social awkwardness, and single minded obsession with his creatures. More incidental autism influenced by our society today. And in this case I wouldn't put him in the genius category. We also loved how the movie allowed him to stay true to character and not have some schmaltzy romantic goodbye kiss. Newt's departure was wonderfully socially awkward and you could see his inner struggle with the emotional moment. I'm sure there are lots more of shows/movies that I haven't seen. Purposeful or incidental, I think it's good for Ethan to see these portrayals. Perhaps he can see himself in some of these characters. Why can't we stop being so judgmental? Judgmental. It's a word that often conjures up negative connotations, but the fact is that in its pure definition (of or concerning the use of judgment) it is our way of life. Our human brain is hardwired to constantly make judgments. It is our executive function that is always 'on'. We constantly process sensory input and the based on our education and experiences we make a decision. It's how the human race has survied and evolved all these thousands of years. However, in our modern society we're not limited to making survival decisions, or even decisions of comfort. I doubt primitave man was thinking, "Gosh, that fur coat undermines the rights of that bear." or "I wouldn't have gone with that shade of brown. It does nothing for her features." No, he was thinking, "I got to get me one of those cause it's freezing out here." On social media I'm constantly reading about the judgment of others, or more specifically the activity of thrusting our judgment upon other people. Also, because I have a child on the Autism Spectrum, I find myself reading how other adults (and subsequently their children) treat other with varying disabilities. From the adult who needs a handicapped parking spot yet isn't outwardly showing why, to the older child still in a stroller, the tragedy of a child being killed by an alligator, or the kid who has no friends to come to a birthday party. We see stories of both the darker side of and generous side of human nature. We also see articles about plus size models or what kind of cosmetic surgery an actress might have had, and we as a society make constant judgments from the vapid to the highly controverial topics of race and religion. And no matter how hard I try to keep an open mind and see things from another's point of view, I'm still passing judgments. In fact, I find myself passing judgments on those I believe are overly judgmental. I think they're less socially evolved. I truly try not to read the comments to online news articles, but like a train wreck I have to look and then I pass judgment on all the idiots. We are hardwired. It takes a lot of effort to overcome it. No one is perfect at censoring our judgments - keeping our opinions to ourselves and being open to the other side. We have to teach our children this new and special life skill needed by a member of modern society. Ethan was lucky enough to go to an elementary school where the teachers, parents, and specifically a PTA initiative (Project Cornerstone) actively pursued teaching kids empathy, point of view, and openess to differences at an early age. I know I've quoted Rodgers & Hammerstein before in this blog, but I'll say so again, when it comes to hate, "You've got to be carefully taught." And by teaching acceptance and how to temper our judgment we are helping our children grow into a better world. I see Ethan as a kid that any other kid is going to easily pick up on the fact that he's got something going on. In this day and age, they'd probably guess Autism correctly. Still, aside from some eyerolling or quiet snickers (which he doesn't pick up on), he's been accepted and has been relatively bully free except for a few small isolated instances and not since elementary. He has kids who've taken him under their wing and kids who look out for him. I can't quite say what's the formula for his self esteem, how much school environment, home life, therapy, his own innate brain personalty factored into his high self esteem, but he has it. A parting anecdote from last week. Ethan's little brother was trying to get him to play a game with him and when the answer was no, his brother complaine to me that Ethan wouldn't play with him because he was socially awkward. To which Ethan blurted out, "I"m not socially awkward!" My immediate thought was 'good for Ethan!'. It's nice that he can stand up for himself. I also set his younger brother straight, Ethan's not wanting to play a game has to do with his not wanting to play with him versus any type of social issue. Yet, secondarily I was thinking, "he is socially awkward." We're constantly working with Ethan to improve his social skills and get him to fight against his isolationist tendencies. And in that same way I have to teach his little brother to not be proclaiming his judgments. They are opinion not fact. And while many of our opinions are develped from facts, we still have to be respectful of alternative possibilities. Long term goal is now short term goal... lots to do. Summer flew by... some of that is due to the fact that Ethan starts school Aug 9th, which seems absurdly early. The school likes to have finals before the December break. Personally, I wish they'd shorten that bread from 2 weeks to 1 week and start school a week later, but I guess I'm in the minority on that. Ethan had an amazing time at overnight camp. It's a super experience for any kid, but especially Ethan to help him build independence away from the home. I don't know that he made any deep connections, but he did get along with his cabin mates as a group and participated in everything. I only got to speak with his counselors briefly at the pickup, but they thought he was great and had no problems. Ethan said he'd go back for another 4 weeks next year, and I think that's the biggest indication that it went well. He also wrote us some lovely 'Ethan-esque' letters letting us know that camp was fun and what he'd been up to. He asked me to write him back about what was going on at comic-con and any new Sonic anniversary announcements. I found that utterly charming. It's been a long term goal for a while now that we thought Ethan would be able to continue on to some sort of higher education. In the last few years, we came to the realization that a 4 year university was indeed an achievable goal. Well, he's a sophomore, and it's time to get serious. I've been researching schools with support systems for kids on the spectrum. They're mostly private institutions, cost a lot of $$$$, and are spread out around the U.S. I'd like to see if there's anything in California, which would be more convenient and possibly better to have Ethan a quick flight or few hour drive away. Ethan also needs to continue fulfilling the academic requirements and developing higher order academic skills. Unfortunately, not so easy in our public schools (the developing skills part). The curriculum is very disjointed and with this last common core paradigm shift, our high school district dumbed down the math by a full year on the average math track. We'll need to think about ways to supplement over the next 2 years without overwhelming him. He'll take the PSAT this fall, so we'll have some sort of indication of how much SAT prep he'll need as well. Basically, what had been a long term goal is now in the short term bucket and we need to find ways to get him prepared academically, but also social and emotionally. I think living away at summer camp was a solid step for the latter. I'm hoping that I'll get cooperation from his teachers this year on working not just on academics, but encouraging social and emotional growth as well. Unfortunately, they don't attend the IEP meetings so we come up with ways for the SLP to push into the classroom to help work on group interactions etc. but then the teachers don't want the intrusion. I'm going to have to lobby them a bit. He's happy, healthy, just got his braces off, and is ready for sophomore year. Ethan finished up his first year of high school a few weeks back. While there were some bumps in the transitions and challenges with how Ethan adapted to how teachers gave assignments and presented course material, overall he had a good year. All A's with one very hard earned B in English Language Arts. He grew and matured a lot. Not starting foreign language this year and allowing him a 'free' period with a study skills class and a little lighter load this year was a good call. It was recommended by district staff to give him an easier transition year, especially because he would be taking all general ed classes. I'm glad we took the advice, even though it sets him back on college courses a little bit. It will be a little tougher schedule next year and he'll be starting Spanish I.
I'm also really glad that he took Drama as an elective. It's practically a social pragmatics class. They work on voice, body language, facial expressions, showing emotions, improvisation. He's taking a second year of it next year. His eye contact/visual referencing is still almost non-existent, but this gives him opportunity every day to work on these skills. Here's a link to a neat article about Autism and Drama that we found recently. Math and Science are still pretty easy for Ethan. He rocked on through 9th grade common core math and biology. Next year he'll have a social studies course instead of a science so that'll make his course load even a little harder. English was full of reading comprehension of point of view, motivations, imagery, metaphors, etc. It was a real challenge for him, but I spent time tutoring and helping him to edit his writing and I think he made solid progress. Socially, he was fairly stagnant and was much like in middle school - he stuck to hanging out with his few close friends, and by that I mean proximity during lunch and class. New students that he met through his classes were still of the say "hi" variety and nothing much deeper. And so I bought Ethan the book Socially Curious and Curiously Social based in Michelle Garcia Winner's Social Thinking curriculum. I liked the idea of a book written for him to read. He's almost done and I've been discussing the chapter review sections (I like how they formatted it) with him. Whether he'll be able to apply it is another story, but I hope to review the book and discuss any progress that I see in the future. My plan was to have him finish it before he leaves for summer camp. Which leads me to the final update topic. Last year Ethan and his brother attended an overnight camp for 2 weeks. They both enjoyed it and I think it's a great experience for young teens in general. Ethan's counselors thought he did very well last year. There is also a support staff for kids with special needs at the camp if Ethan needs it. This year I'm sending them for 4 weeks. My hope is that the longer time period will give Ethan more time to become comfortable with his bunkmates and perhaps forge some more meaningful social interactions. I'm really curious to see what happens. It's also an opportunity for him to gain more independence from us. He's sort of innocent and immature in that respect. I hope to have more to share later this summer. April 2nd was World Autism Awareness Day and April is Autism Awareness month. Every year, I like to try and post something that other parents or those on the spectrum might find useful. But first... last week Ethan made me smile about the idea of Autism Awareness when he gave what I've now decided is the most Autistic answer ever. The three of us were spending the morning checking out new minivans (don't judge me - I love my minivan). The man then shook my hand "Hello, and you are?" "Risa," I replied and he repeated his name and my name in greeting. He then reached out to Ethan. "And you are?" "Me," Ethan said, then got flustered, "I mean, Ethan." The guys smiled and shook his hand, "Me, I like that. Hi, Ethan." It was cute, but also extremely telling. Ethan was of course not very practiced in having salesmen introduce themselves and he was caught off guard. Ethan's natural instinct... the hardwiring in his head made him quickly answer, "Me." This is the core of Autism and where the developmental disorder gets its name. Ethan's natural wiring makes him view the world as it is relative to him and versus others around him. But Ethan's had a lot of therapy, so he very quickly (almost split second) realized his mistake and then gave an appropriate response. Ethan was then prepared for the next three dealers and introduced himself easily to the salesmen when prompted. Ladies and gentlemen, the fruits of a lot of Cognitive Behavioral Therapy. So that's what I'll share this year. Cognitive Behavioral Therapy (CBT) has become the cornerstone of Ethan's therapy and our parenting style. When he was younger early intervention and therapy evolved. He started with more structured ABA/DTT and it progressed into generalized therapy and play based therapy. But as he grew older and more aware (around 9/10 years old), his therapists introduced CBT based interventions such as the "Incredible 5-point scale" and other techniques for him to work on emotional regulation. 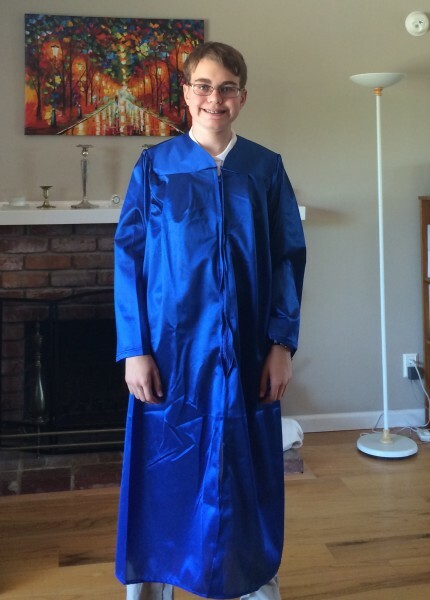 As he reached middle school we relied on social skills that were taught using CBT techniques. CBT has been around awhile in general personal therapy to help address issues by taking on action oriented approaches. It's now become a critical tool for those on the moderate to high end of the spectrum as they mature. My caveat for all therapies has always been that no "one" therapy is superior and it truly depends on the individual and most benefit from a 'cocktail' of various approaches. But for those with a teen/young adult on their hands may be wondering what to do now. There are many resources that are CBT based. I think that Michelle Garcia Winner's Social Thinking also falls under this heading. Many of Ethan's therapists had some training or familiarity with her techniques. My plan for the summer is to introduce the book Socially Curious and Curiously Social to Ethan. I'll let you know how it goes. I previously reviewed the New Social Story Book here. There are many more resources out there and I see CBT as a place to go as your child starts to outgrow early intervention therapies. Generally speaking, people on the spectrum tend to be very literal. They're sort of hard wired that way. Ethan does very well academically with math, science, spelling, grammar and even history facts. But in the social sciences, areas that ask for opinon, inferencing, and applying point view are extremely difficult. This last quarter in 9th grade English, Ethan (like many other 9th and 10th graders across the U.S.) read Shakespeare's Romeo and Juliet. As if reading English from the 16th century isn't difficult enough, Romeo and Juliet is full of poetic verses full of imagery. Metaphors are not in Ethan's wheelhouse. He's just barely detecting sarcasm at home. So how do you think he did at identifying metaphors, similes, and light and dark imagery? Poorly. First time ever in his academic career, he was seriously flunking. I tried tutoring him to help him with homework and quizzes and it helped a little, but his grade was in the toilet. The only hope of saving his English grade was to do very well on the final essay on light and dark imagery. I was tasked with how to get through to him on the topic. When Ethan was younger, I'd often use whatever interested him in order to help re-teach. So tv shows, movies, super heroes, etc. were great tools to give examples that he could understand and relate to. How was I going to teach about the obsessive love played out in light and dark imagery in Romeo and Juliet? And then it come to me. Enter the lightsaber! A modern day epic that absurdly overuses light and dark imagery as much as R&J: Star Wars. And courtesy of the prequel trilogy there's an obsessive forbidden love story. So we had some long conversations in which Ethan was able to point out all the wonderfully obvious uses of dark and light imagery in the original and prequel trilogies along with the imagery used in the doomed love story. While the execution of prequel trilogy isn't great and the dialogue cringeworthy, the story is solid and worked great to get Ethan thinking about the use of light and dark imagery. It took some serious coaching but Ethan constructed an A+ Essay and brought his English grade back to a B. Ethan was happy and proud. So thank you George Lucas for your overzealous use light and dark imagery. Wow, 2015 flew by. We spent the vacation week in Los Angeles seeing Star Wars The Force awakens and checking out the Warner Brothers Studio and the California Science Center (learning about upcoming Mars exploration). Ethan truly enjoys going places and checking out ineractive exhibits. He loves movies and has always had an uncanny memory for release dates both past and future. Seriously, we can ask Ethan for the known release dates of upcoming Star Wars and Marvel Comicbook Universe films and get faster answers than we would to look up on Wikipedia. Naturally, he enjoys movies and learning all the behind the scenes things. It makes me wonder if a career in the movie tech industry wouldn't suit him well. His first semester of high school went really well. Finals were a challenge. It was his first time learning to study for large comprehensive exams. There's room to grow in that respect, but overall he had all A's with one B- in English, which is the hardest subject for him. Lots of higher order thinking and analysis are the challenge. We'll continue to work with him on his thought organization and writing. Math and Science come easy to him. He's also been taking Drama as an elective which turned out to be what we hoped. He's working on voice, body language, facial expressions, character, etc. It's practically a speech pragmatics class but more fun thinking about movies and theatre in a big class of 30-40 kids, but they often break into pairs and small groups. We have a tri-ennial IEP coming up and we need to think about his schedule and supports for next year. He's on college track and will need to start Spanish in addition to Eng, Math, and I think History. Next year will be harder for sure. We'll continue to take it as it comes. If there was one thing I'd really love to see him attempt, it's to make a new friend or two. He has lots of classmates and acquaintances that he'll say 'hi' to in passing, but he hasn't had interest in forging a friendship. He's very solitary and prefers it that way. He has a friend that he's had since kinder that he will sometimes eat lunch with and get together outside of school, but other than that, it's his brother that is his social companion. I suppose it has to happen organically, but I wish he'd find another friend or two to connect with and socialize with outside of school. I'd love to see his social interest develop. He has very little right now. He spent two weeks away at summer camp last year and this coming summer we've planned for 4 weeks away. I think it'll be a good experience for him both from the independence and life experience standpoint, but I also think having the additional 2 weeks might allow him to forge some summer camp friendships. All in all a good year with lots of growth and development and academic learning. It's been a little over two months for Ethan in high school. All in all, the transition has been pretty good. He had a few bumps the first few weeks getting used to the new routine - not unexpected. He's had some issues with the e-systmes (a lot of assignments are turned in electronically), but that seems to be getting better. Unfortunately, there is a shortage of speech therapists in our area (especially for lower income districts), and the district is not in compliance with his IEP services. They say they are working on it and have said they will make up missed sessions for speech and social skills... we shall see. Still overall, he's transitioned and is happy and doing well in his classes. We are very encouraged. It's got me to thinking about the long road that brought us to this point, and I can't help thinking of all the good advice that I've received over the years. There's been many therapists, clinicians, educators, and parents of special needs children that I've come in contact with over the years, who now in hindsight, had significant contributions to Ethan's development and success. I'd like to talk about a few of them, and perhaps pass along some of their good advice to consider. The first few years after the diagnosis were a whirlwind and steep learning curve. We really didn't know what to expect from IEPs and the school district. We also had an "n of 1", meaning we knew Ethan, but had no idea where he fell on the spectrum and how he was progressing compared with other kids. There was a contract behavior case manager those first two years and I think she recognized that Ethan was mastering skills quickly and progressing at the special day class (autism). She strongly suggested that we ask to have Ethan partially mainstreamed part time in the state preschool (socioeconomic/at risk preschool kids) that was on the same campus. I think this early success at partial mainstream with a 1:1 aide those first two years benefitted him greatly and prepared him for full inclusion starting in kindergarten. I don't know that we realized how quickly he could progress. Sadly, about a year later, this behavior case manager was let go amidst a massive unilateral canceling of all autism and special educations services by a brand new superintendent. Of course all the parents were in uproar and threatened legal action. The new superintendent had no clue about IEPs and the IDEA law and didn't understand what he was doing was illegal. So he had to quickly bring in consultants and re-hire therapists. It was a huge nightmare but out of it we received in independent evaluation of Ethan's ABA therapy program. She was very experienced in the field and gave some good insight into how Ethan worked. She was the first person that we heard say that Ethan was 'sensory seeking'. This made a lot of sense and would impact how therapists would interact with him. She also suggested to move even faster in his therapy and move mastered skills to maintenance. At that point there was no one overseeing the therapists (many younger and with minimal experience) and it helped to give them direction to move as fast as Ethan would allow. While Ethan is high functioning, I've met many parents of lowering functioning kids over the years. It's been a good influence to hear about how they cope and educate their kids. There was one woman that I saw for many years over the summers at our neighborhood pool. Her son was about 5 years older than Ethan and was very low functioning. He was non-verbal and would vocalize much like a dolphin when he was in the water. The first time I met her she was watching her son swim in the deep end. A lot of kids stayed away from her son, but Ethan was curious and would swim up next to him. They both loved being in the water. She saw me watching and said, "He's autistic, but very sweet." I told her that Ethan was on the spectrum as well and that's probably why he wasn't bothered by her son's odd behavior and vocalizations. Ethan (even to this day), doesn't really observe other's behavior as normal or not normal. It's a special way to go through life. Over the next few years, I would hear about how her son was doing and her support system. But most of all I was struck by her expectations of him. He had to obey the pool rules or else he had to get out. So sometimes he would hang on the diving board or the deep end ropes (not allowed) or other infractions of pool rules and she would warn him once then get him out of the pool if he did it again. She talked about how even with the lowest functioning kids, that behavior is learned and that she enforced strict rules. She used visual schedules and reward charts to help with his behavior, and she didn't let him get away with things because he was autistic. She had a firm belief that even as a teenager, he was still learning. She talked about how there was such a strong focus on early intervention, but that it wasn't the end of the line when they reached 8 years old. Even as teens and young adults, they could still learn. She still worked with her son on language, and despite the fact that he only had a few scattered words, she pushed him to use them. She would say that just because he was non-verbal at 15 didn't mean that he still couldn't develop some language use. Her advice had a profound influence on my thinking. I began to not think that the goal line was outgrowing the diagnosis. Ethan will always be autistic, but he will continue to learn and develop even as an adult. It also allowed me to expect more from him as a child. Another parent that I encountered a few years back had a son that was higher functioning similar to Ethan. She had a great outlook regarding education of special needs kids. She believed that,'every thing you teach them as a child is one less thing you will have to pay someone to do for them as an adult.' It applied to all levels. If higher functioning kids can be educated to work full time or part time, then it lessened the burden on society to support them. But for even the lowest functioning kids, if they could tie their own shoes, make themselves a bowl of cereal, etc., - whether it's riding a bus or simply getting dressed themselves, those are all things that you won't have to pay someone to do for them as adults. It's solid thinking and I wish administrators in public education could begin to think that way. I'm long winded today, but the last bit of advice that I got, I've shared before but must share again. Consider speaking with a clinician regarding medications. We waited until Ethan got a little older because we were cautious about medicating children, but the facts out there are that a lot of kids and adults on the spectrum benefit greatly from various medications. They don't treat autism, but a variety of medical issues that are prevalent among those on the spectrum. One leading psychiatrist in the field of autism research had an interesting off the cuff remark to me when I reported how well Ethan was doing on prozac (the 2nd SSRI we tried). He said, "I wish everyone on the spectrum could try an SSRI... or two." I don't think he meant it literally, but that he'd witnessed many on the spectrum benefit from finding the right SSRI and that it was worth trying. There's been countless advice and food for thought that we received over the years. It's hard to pinpoint all the one's that have influenced our parenting, but I just wanted to pick out a few that quickly come to mind. Wow, high school years begin tomorrow! Ethan attended orientation last week, got his schedule, books, and student ID. He said it went well and saw people he knew. I asked him if he said, 'hi' and he replied, 'I think so.' Very Ethan. He told me that he still ate lunch alone (of his own accord). I do worry about him interacting and taking social interest with other kids. We'll keep encouraging him to try and connect with a little more than the superficial. There will be kids that he knows both from elementary and middle school, and I've also talked to him about the idea of making new friends. It continues to be the biggest issue of his autism: the lack of social interest. All the other things, like 'scripting' and lack of visual referencing, odd tactile seeking behaviors, etc. are small compared to the overreaching detachment from social situations. He had a good summer vacation and even attended a 2 week overnight camp. The other day we were out with a group of friends at an amusement park and his detachment was evident. He's part of the group, goes on the rides, eats together, takes photo ops together, but he doesn't interact or contribute to the conversation in any meaningful way. There's an esoteric difference between the way the other boys and my younger son interacted compared with Ethan. I think summer camp was much the same way. He's there, in the group, participating in games and activities, but he's not craving any kind of deeper interaction or friendship. I'm optimistic that what we have put in place with the IEP will support him and that teachers/staff will execute it. I always worry about communication and education at the beginning of the year. Schools are so understaffed with huge class sizes and case loads that I tend to micromanage these first few weeks, communicating Ethan's core behavior, issues, tips and trick, IEP goals,etc. with teachers and staff. I work on a one-sheet that puts all the key info into one convenient place. I've encouraged his schools so much that his middle school ended up using the format for most of their special ed included students. It's truly beyond helicopter parenting. I joke I'm the black hawk of helicopter parents. I'm more stealthy. I get in, do the job, then get out. I'm less worried about academics, but this year the level will get higher. The math, English, and Biology classes will be more challenging, but I felt that way about the transition to middle school, but he ended up doing so well and far beyond our expectations. I guess I've also set the bar a little higher now. I never used to. I think that's a good thing. High school here he comes! Today was Ethan's last day of middle school. I vividly remember my abject fear of his heading to middle school three years ago. It is undoubtedly the worst age for adolescents. Seriously, for most people, it is middle school where they remember their insecurities, the cruelty of others, the anger and the world and universe. Well, I do. And some of my friends. Ethan? Not so much. I wish I could bottle his general amiableness. He cruised through, at least I'll give credit to 'with the help of Prozac.' Granted, he was at a halfway decent school and had a lot of supports in place, including a really dedicated group of teachers and administrators. He grew (over 12 inches) and developed. Even some higher order thinking skills began to emerge. He had almost all A's in a general ed track. He became more independent. Unfortunately, what didn't happen was development of social interest. Three years later, and while he has some school acquaintances, he hasn't developed any friendships. He's no worse for wear, but I truly worry about his lack of attachment and interest in his peers. It's the core of autism. He is quite often unto himself. What's next? High school. We have an IEP in place to give him social and emotional supports for his college track program. I'm a lot less worried about his treatment than I was for middle. I'm optimistic that most of the kids at his high school are coming from his middle school and in general this school is known for a good student body and not known for serious bullying. I really think bullying peaks in middle school. At big milestones like this, I often reflect on how far he has come. He barely spoke but a short list of words until five (and only when prompted). He was 'spacey', he wandered, he cried a lot at the oddest and most unexpected times. Toilet training was a long and unpleasant journey. Eating was often a challenge. I often say, he's worked harder than most because for years he went through 10-15 hours a week of ABA/DTT/Etc behavorial therapy, speech therapy, facilitated learing. At school he had many many evaluations and testing (additional to academic testing). As anyone familiar knows, early intervention is... emotionally exhausting at times. As he got older we started in with clinical trials - he had MRIs, EEGs, and lots and lots of behavioral and social testing and evaluation. Not to mention blood draws. He's done the work and come a long long way. No one in the medical realm will ever talk about prognosis for kids on the spectrum. They really don't. It's the elephant in the room. He who must not be named. But kids will progress. Some more than others, but all progress and achievement are welcomed and celebrated. I still hesitate to talk about his future, but I do investigate some potential paths for him to take. Here's to you, Ethan. Congratualations my high school teenager.